VT Full Body Vibration Platform Fitness Machine - Pivotal Oscillation - Compact Size - Quiet - Timer - 60 Speed Level, VT017 by Vibration Therapeutic at M's Dance Center. MPN: VT017. Hurry! Limited time offer. Offer valid only while supplies last. Model VT017 vibration plate uses a cam mechanism to generate pivotal oscillation, resembling the motion pattern of a fast moving teeter-totter. Model VT017 vibration plate uses a cam mechanism to generate pivotal oscillation, resembling the motion pattern of a fast moving teeter-totter. Compared to our high vibration frequency model, this model runs on low to medium vibration frequency range. Such vibration pattern is designed for users primary focusing on weight management, pain reduction, micro circulation improvement. 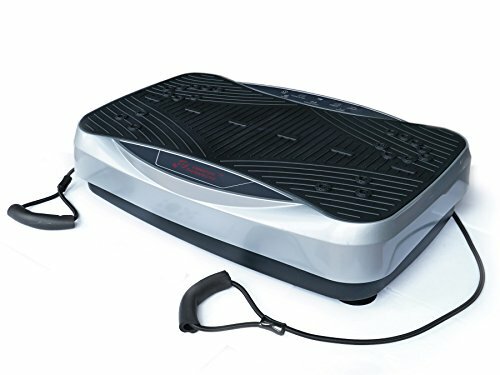 In general, VT vibration plates are beneficial for fitness, body fat loss, improved blood circulation, improved bone density, muscle relaxation and pain reduction. This vibration plate comes with resistance bands for working on upper body. VT vibration plates are made to last with durable structure, material, parts and components. Perfect size to keep in office or bedroom for frequent use. Machine dimension: L21.5" x W14.5" x H5.6"
Vibration Frequency: 5 - 10 Hz; Max Amplitude: 0.32"
Operates very quiet even on the highest speed; Perfect size to keep in office or bedroom for frequent use.